The divine Snuggle Suede Soft Dog Beds were developed with only the dog’s comfort in mind. Elegant brown leatherette strap designs are fused with high quality but more importantly super soft, dog friendly alcantara suede and synthetic sheepskin materials, creating a perfect snoozing experience fit for every four legged king and queen. 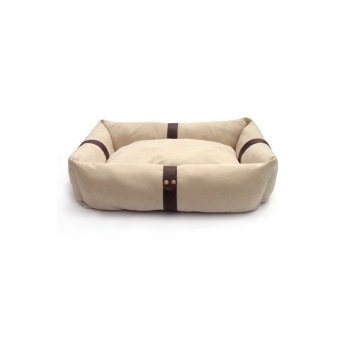 As these deluxe soft dog beds are available in six different sizes ranging from extra small to giant, and also six different colours (Blossom Pink, Soft Ivory, Mellow Tan, Dark Chocolate, Khaki Green and Flame Red), there will be a bed for everyone’s taste, style and most importantly, every dog. The comfortably padded centre cushion of each bed is completely removable and therefore reversible for different looks. One side is covered in the coloured alcantara suede matching the outer suede bolster cushions of the bed, whereas the other cushion side is made from the super soft, cream coloured synthetic sheepskin material, which your dog will love to curl up on. Depending on the weather, you can offer your dog a super warm side to snuggle up in or a slightly cooler side, so he or she does not overheat too quickly in warmer weather. As dogs sometimes seem to attract everything muddy in the garden, these soft dog beds were designed to be fully machine washable (30 degrees Celsius). The centre cushion cover is zipped and can be washed without the inner cushion, though the inner cushion is also machine-washable if required. Please note that after a high speed washing machine spinning cycle, you may have to give the inner cushion a quick shake to spread the filling back evenly. The bolster cushion base is also completely washable and the corners have been stitched to prevent the filling in each bolster side cushion to move around. The base of the soft dog bed is made from black breathable material, which will prevent your dog from sweating (compared to waterproof linings that can trap moisture and make the dog bed or even the dog smelly). Last but certainly not least, these Snuggle Suede Dog Beds are also perfect to put into our metal or fabric dog cages whilst traveling. On the larger sizes, the high padded sides mean that your pet has something soft to lean against whilst in a cage when you are driving around corners. An ultimate dream of a bed, which helps to reduce sore pressure points on legs and soothes bad joints. Impress your friends with this incredibly elegant dog bed - it will look smart in any home. Perfect also to comfort puppies who have been weaned off their mother and are spending their first nights apart from their four legged family. This extra small size is absolutely perfect for several little puppies, kittens or even a cat. Toy and small dog breeds like Chihuahuas, Miniature Dachshunds, Yorkshire Terriers etc. will be most comfortable and at home in this size. Please always bear in mind if your dog is a "stretcher" or a "curler" whilst sleeping when choosing the right size of bed. Ultimately, this is the most deluxe and super soft bed your dog(s) will ever sleep on. 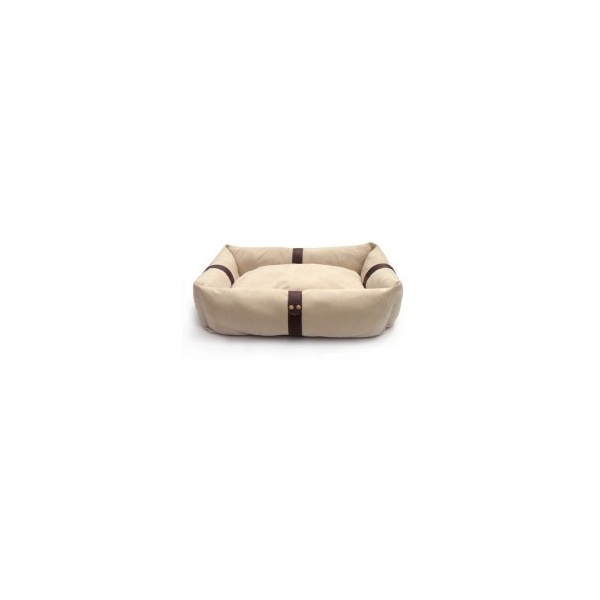 High padded sides with elegant, tightly stitched leatherette straps with smart brass buttons add an elegant twist to this must-have exclusive range of soft dog beds. Your dog will never look back once he or she sets paws on one of our divine Snuggle Suede Pet Beds.